The species is very variable in color and shape, but usually presents a pattern of closely set, wavy axial (“vertical”), dark lines against a light-olive background. A rare find locally on Sanibel-Captiva, the species is relatively common in other parts of Florida and the Gulf of Mexico. The 15 mm (0.6-inch) shell in the photos was found on the beach on Captiva by Kimberly Nealon, on the first weekend after Hurricane Irma’s visit in September 2017. 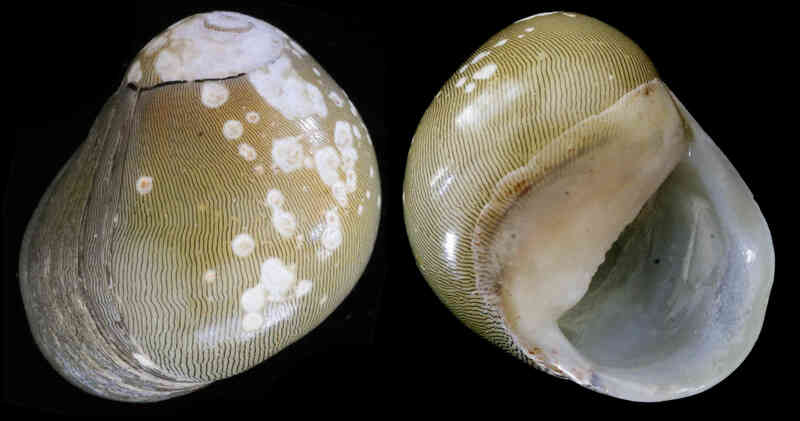 Given that the species prefers to live in brackish water areas, this shell probably washed from the back-bay areas or was possibly transported from the Caloosatchee estuary by the recent freshwater releases. In February 2018, Lorin Buckner collected live Olive Nerites under the Memorial Bridge (Caloosahatchee River) in Fort Myers.